Dr Abdul Rahman (second right) hands a mock Sares key to one of the community leaders as Sikie (third right), Syed Fauzi (right) and others look on. 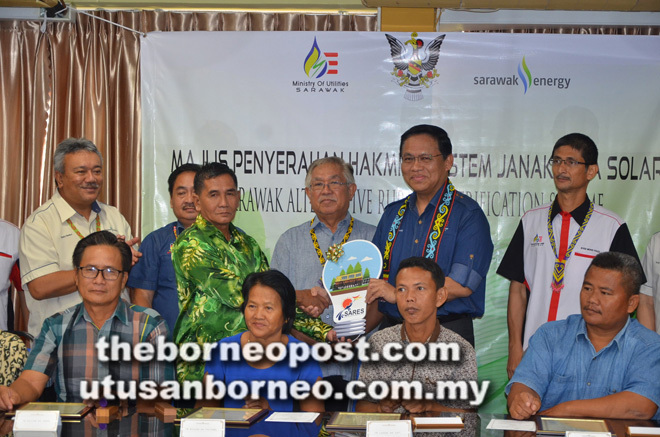 TATAU: Almost 1,200 residents from 204 households in 10 longhouses in Tatau now have access to reliable and renewable 24-hour electricity supply under Sarawak Alternative Rural Electrification Scheme (Sares). The 10 longhouses are Rh Malo, Rh Sekaya, Rh Samun, Rh Kanyan, Rh Nyuan, Rh Lasok, Rh Billy, Rh Layang, Rh Sylvester Bunsu and Rh Sujan. Under the community-based Sares, the Ministry of Utilities, Sarawak Energy Berhad (SEB) and the ten remote communities worked together to build solar systems for their respective longhouses, chosen due to the challenge of connecting them to the grid. The Sares project for Tatau cluster, which kicked off in the middle of 2017 costing RM12.3 million, was commissioned early January this year. The official handover ceremony to commemorate the completion of the project and the lighting up of the 10 longhouses was held at Tatau District Office yesterday. Assistant Minister of Rural Electricity Dr Abdul Rahman Junaidi officiated at the ceremony. Present were Assistant Minister of Native Laws and Customs and Kakus assemblyman Datuk John Sikie Tayai, Ministry of Utilities’ director of Electricity Supply Syed Fauzi Shahab, SEB Bintulu regional manager Yong Hua Keh, representatives from relevant agencies and community leaders. “To-date almost 91 per cent of our rural households have been connected with electricity supply, which means there is only nine per cent left, comprising 30,400 households yet to be electrified,” he said. Abdul Rahman said the initial target of the ministry was to have 24- hour electricity supply to all households in Sarawak by 2025 before Chief Minister Datuk Patinggi Abang Johari Tun Openg set 2020 as the new target in order to expedite the electrification process. 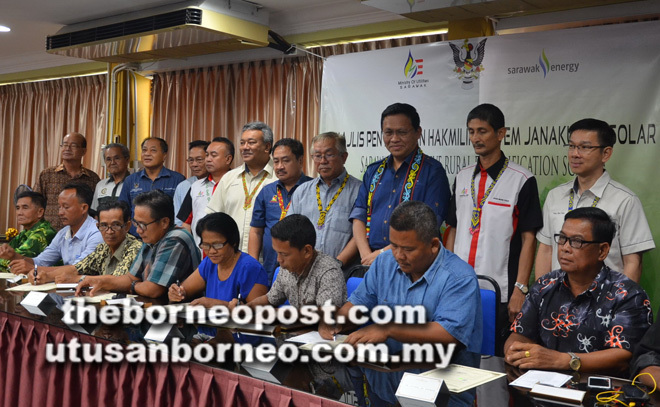 Abdul Rahman said another 18 longhouses with 313 households in Sangan Tatau will also be connected with electricity under Sares soon. (Back row) Dr Abdul Rahman (third right), Sikie (fourth right) and others witnessing the signing of documents by the representatives of the longhouses. He explained that Sares is a continuous project introduced at the ministry level under the 11th Malaysia Plan in collaboration with SEB to achieve 100 per cent electricity supply to all houses, villages and longhouses in the interior of Sarawak by 2020 by installing standalone alternative systems, utilising micro-hydro and solar technologies. Since its implementation in 2016, a total of 2,600 households in 106 villages and longhouses in the remote areas in the state previously powered through diesel-fuelled generator sets are now enjoying 24-hour unlimited electricity through Sares. Under Sares, communities take ownership of the systems and do not have to pay for the electricity that they consume and are no longer wholly dependent on diesel. “A total of RM500 million are allocated to electrify 8,700 households under Sares in five years between 2016 and 2020. “These areas either have no access road or are located outside the power grid system,” he added. Dr Abdul Rahman said providing electricity to all households in Sarawak is a big task for the government due to the logistical challenges. micro-hydro specially for households in the remote areas that have no access to the power grid system. “With solar power system, the people will enjoy reliable electricity and more environment-friendly source of power compared to the costly diesel generators,” he added. He hoped the solar panels installed in each longhouse will be taken care of properly in order for the equipment to operate over a longer period of time. He believed the technical team from SEB had conducted briefings to the respective village and longhouse committees on how to handle the solar power system properly. Sikie, on the other hand, hoped Sares could light up the remotest area under his constituency. “Grid connection to all households especially in the remote and isolated areas will take significant amount of time, but solar power system and micro-hydro are two alternatives that can be utilised and hopefully it can reach up to Ulu Kakus in the future,” he said. Sares systems cater to typical rural household electricity needs with lighting, fans, a television, freezer and cooker and are simple in design without compromising on safety.